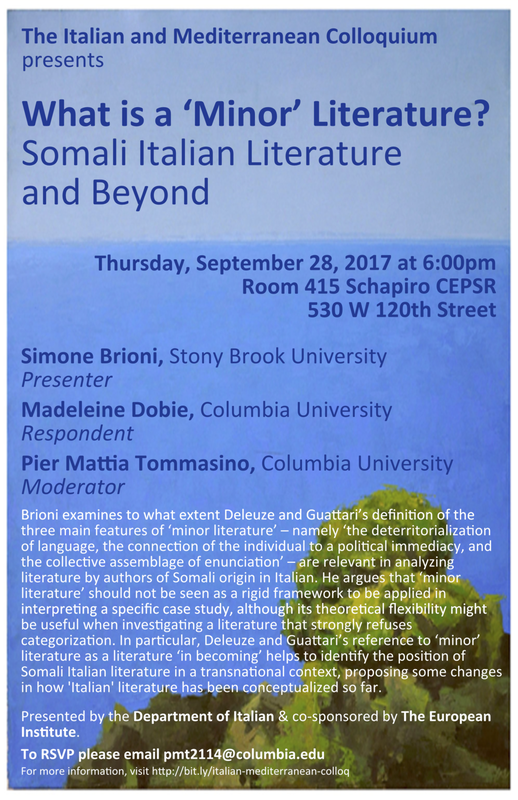 Simone Brioni examines to what extent Deleuze and Guattari's definition of the three main features of 'minor literature'- namely 'the deterritorialization of language, the connection of the individual to the political immediacy, and the collective assemblage of enunciation'- are relevant in analyzing literature by authors of Somali origin in Italian. He argues that 'minor literature' should not be seen as a rigid framework to be applied in interpreting a specific case study, although its theoretical flexibility might be useful when investigating a literature that strongly refuses categorization. In particular, Deleuze and Guattari's reference to 'minor' literature as a literature 'in becoming' helps to identify the position of Somali Italian literature in a transnational context, proposing some changes in how 'Italian' literature has been conceptualized so far. Simone Brioni is an Assistant Professor at Stonybrook University. His research interests include Postcolonial Theory, Migration Studies, Intersemiotic and Intercultural Translation, Postmodern Literature, and Film Studies and Filmmaking.